Last week I had the pleasure of sitting on a conference panel with one 'Abd al-Hadi Khalaf, whose analysis of Bahrain's strategy in handling the uprising I much enjoyed. I was also happy to find out that we shared several common opinions about the nature of the struggle going forward, primary among which is the novelty and importance of the Sunni mobilization in Bahrain over against the same old story of Shi'a-led opposition. As I've mentioned previously, I'm currently in the process of finishing a theoretical introduction to an upcoming volume on sectarianism in the Gulf being organized by Georgetown University's Center for International and Regional Studies. As such, I don't have time to write an entire lengthy post on this now, but it bears mentioning (especially in light of my discussions with 'Abd al-Hadi) the main political news out of Bahrain these days: that it is now the Sunnis (at least those in the National Unity Gathering) who are threatening boycott of the still-rumored upcoming second round of dialogue, ostensibly because the physical conflict is still ongoing--that is, because al-Wifaq and "its followers" in the street continue to fight for "regime change." This scenario is upside down and unfamiliar to us to some extent because local political affairs observers are used to seeing the radical opposition abstain from accepting continuous initiatives in order to stick to its demands and to preserve its interests. They are not used to seeing other non-radical political societies having reserves against such initiatives although these initiatives serve their interests. 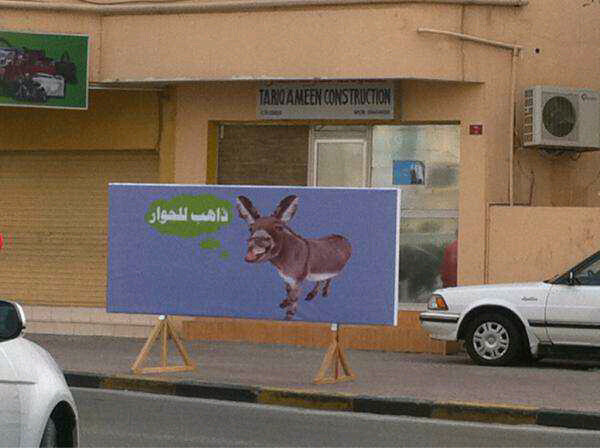 A billboard in Muharraq depicts one "going to the dialogue." In support of the boycott, the Al-Fatih Awakening used its Friday rally to counter those organized by opposition groups to demand a restart of talks. Importantly, however, their primary argument against the initiative is that it includes only the opposition groups--i.e., that they, Sunnis, are excluded from it. (On this point, see this previous post.) In other words, it's not that Bahraini Sunnis wish to prevent a political solution out of some hatred of Shi'a or fear of Iran, but that they simply don't want to be stuck watching the process unfold from the outside looking in. Thus the rally poster below: "No dialogue without Al-Fatih." On the other hand, this decision to boycott has met with condemnation from other Sunnis--see Faysal al-Shaykh in Al-Watan--who, having witnessed the decisive impact of the National Unity Gathering in February and March, now fear the return of Sunnis to the political margins to the benefit (in their view) of precisely those who are responsible for the chaos of the previous year. A boycott, in the words of al-Shaykh, "would mean that the hundreds of thousands who stand behind the Rally won’t make their voices heard at the dialogue table." In short, a government-opposition dialogue represents an attempt to return to the status quo ante, one that increasingly looks undesirable to ordinary Sunnis. A Sunni boycott--like that in post-2003 Iraq, or like al-Wifaq's pre-2005 boycott--will only ensure that they remain on the political sidelines, and gain disproportionately little from any eventual agreement. As al-Shaykh says, despite the dangers of accepting dialogue with a "radical" opposition, "leaving the field vacant can also prove disastrous." "Our decision earlier to boycott dialogue with the government is not final," he revealed. "We could consider our stance depending on the situation. "I would like to state here that the government should not engage in any dialogue under pressure [i.e., from al-Wifaq or from the U.S. (on the latter, see here)]." The state, of course, or at least the king's faction, is I'm sure happy to hear of this boycott, which leaves it free to (attempt to) cut a deal with the opposition without fundamentally altering its position vis-a-vis the rest of society. Yet even if the National Unity Gathering or other Sunni groups did participate, under no circumstances will the government entertain three-way talks ('Abd al-Hadi mentioned that the last time that the ruling family, leading Sunnis, and leading Shi'is all sat at a negotiating table was in the 1960s), since even the outside chance that the leaders of al-Wifaq and the National Unity Gathering could agree on a (n albeit limited) set of political demands is enough to put the fear of God in the Al Khalifa. For Sunnis who desire genuine political reforms such as an end to corruption and political naturalization, the dialogue is an opportunity to push these issues (since they will find easy agreement with Shi'a), but the danger of appearing to be in collusion with the Shi'a opposition--and efforts by some in the state to promote this notion--is a real one. For Sunnis who desire political reform in the opposition direction--i.e., a further-empowered prime minister--participation in the dialogue reinforces Bahrain's post-1999 political modus operandi of piecemeal political deals between the opposition and king following periods of instability and protest. But, absent some mass Sunni mobilization against the dialogue, a boycott would do nothing to help this situation, as the state could simply go ahead without Sunni involvement. For the king's faction, another dialogue with the opposition represents continuation down the same familiar political path. Sunni boycott would be a welcome development (so long as it is not accompanied by mass protests against the dialogue that preclude it altogether); and if they do participate their negotiations will almost certainly be held in parallel with those of al-Wifaq rather than together. For the immoderate Al Khalifa led by the prime minister, a second dialogue must be seen as a step in the wrong direction to the extent that it offers a chance an end to the political crisis that has aided in its empowerment over the previous year. Mobilizing Bahrainis against it--by suggesting, for example, that it is born of U.S. pressure--would seem to be the preferred course of action. Update: A very interesting piece of news: National Unity Gathering Vice President, Muhammad al-Uthman, has left Bahrain seeking "political asylum" in Britain. 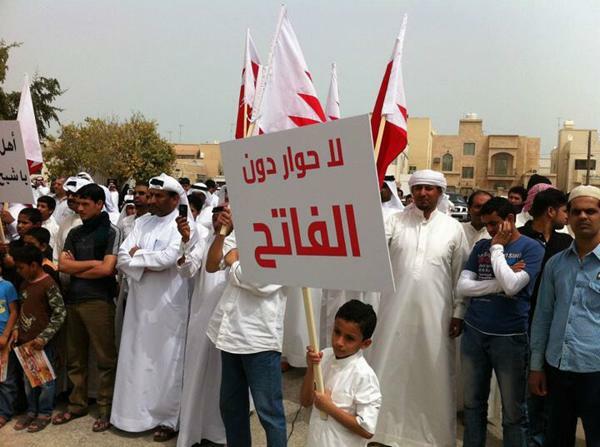 It seems some Bahraini Sunnis at least are anticipating a clampdown on their newfound political activism. Perhaps the regime did not appreciate their effort to boycott its dialogue.